Largest increase in number of Jews this year was in Israel. Greater Tel Aviv has 3 million Jews, NYC has about 2 million. After decades of steady decline, the total number of Jews in the world increased slightly in 2010, according to a study by the Berman Institute / North American Jewish Data Bank University of Connecticut. The number of Jews outside Israel declined, but their number inside Israel increased, said study editor Prof. Sergio Dellapergola of Hebrew University. The size of world Jewry at the beginning of 2010 was assessed at 13,428,300. World Jewry constituted slightly less than 0.2% of the world’s total population of 6.9 billion. This means that one in about 510 people in the world is a Jew. According to the estimates, between January 1, 2009 and January 1, 2010, the Jewish population increased by an estimated 80,300 persons, or about 0.6 percent. This compares favorably with the dismal 0.1% average growth rate in more developed countries, but is less than the average 1.5% rate in less developed countries. 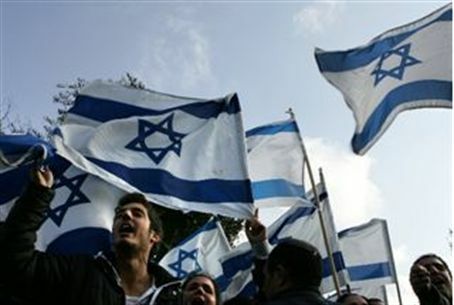 Israel’s Jewish population surpassed 5.7 million in 2010, comprising over 42 percent of world Jewry, according to the report. This represented a population increase of 95,000, or 1.7%, from 2009. In 2009, the Jewish population of the Diaspora decreased by about 15,000 (-0.2%). The core Jewish population in the United States was assessed at 5,275,000 and was estimated to have diminished somewhat over the past 20 years, after peaking around 1990. Prof. Dellapergola noted, however, that the Jewish nation has yet to recover from the Holocaust. Were it not for Germany's genocidal war against the Jewish nation, he estimated, the total Jewish population in the world would have reached about 25 million by now.